The unit is completely automatic and operating for your maximum benefit and air condition with internal humidity control, external temperature sensor, light switch timed overrun, and options including air quality control of both intake and ambient room air. 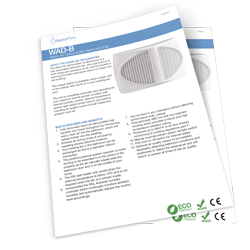 The system becomes increasingly effective with the addition of Vapour vents in the bedroom areas . The WARM AIR BATHROOM DEHUMIDIFIER fan is supplied with an internal Autostat and heater. The fan will include 2 MagLev motors of no more than 2.0 watts each extracting automatically at no less than 85m3/h and intake at no less than 40m3/hr.